The current Daintree ferry contract is due to expire 30 June 2021. Douglas Shire Council is planning to issue tenders for a new contract no later than 30 June 2019 with the aim of awarding a contract by 31 December 2019. This would allow 18 months for the successful tenderer to prepare for a seamless transfer into a new contract..
Before preparing tender documents, Douglas Shire Council is seeking input from all stakeholders with regard to any enhancements to the ferry service they would like Council to consider. The Daintree Ferry operates daily between 5am and midnight. EFTPOS is available at the ferry all hours. There is a priority lane for locals and this operates between 9am and 4.30pm during the peak season. Douglas Shire Council offers locals residing in the regions of Douglas Shire, Mareeba Shire Council, Cairns Regional Council, Yarrabah Aboriginal Shire Council, Tablelands Regional Council, Cook Shire Council, Wujal Wujal Aboriginal Shire Council, Hope Vale Aboriginal Shire Council and Cassowary Coast Regional Council free travel on the Daintree Ferry from November 1 until February 28/29 annually with a free “Douglas Card”. The card also provides discounts to local attractions including two free adult tickets for the Mossman Gorge shuttle bus. Use of the Douglas Card is restricted to fare categories Motor Car and Utilities (private use), Pedestrians and Bicycles and Motor Bikes. To obtain a free Douglas Card, applicants need to provide photographic identification and additional proof of residency with their application to confirm local status at any one of the above local government areas. Application forms are available HERE. Council provides concessional travel on the Daintree River Ferry to all persons who fulfil the eligibility criteria, subject to the terms and conditions of the Daintree River Ferry Concessional Travel Policy being adhered to. Concessional travel cards cost $16 for residents and ratepayers of the Douglas Shire or $38 for residents of Wujal Wujal and residents and ratepayers of the Cook Shire bounded by the Bloomfield River and the Black Mountain turn-off. Application forms a concessional travel card are available from Council’s Mossman Administration Building, the Mossman Library or the Port Douglas library kiosk. A Visitor Tickets book of 55 is also available to concessional travel card holders for $16. You can also click HERE to download an application form. Concessional travel cards are valid until April 30, 2019, and are available from Council’s Mossman Administration Building, 64-66 Front St, Mossman. The monthly statistics for the Daintree Ferry date back to 2004 to provide local businesses with ferry usage compared to previous years. 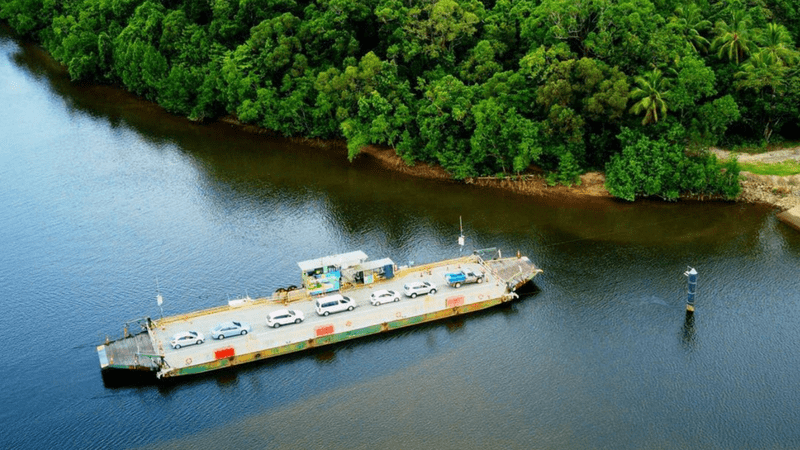 The latest statistics are detailed in Monthly vehicle traffic statistics for the Daintree Ferry – March 2019. Fees for travel on the Daintree ferry are outlined in Daintree Ferry Fees 2018/19. The Daintree River Ferry is a cable ferry across the Daintree River and is the only cable ferry operating within tropical Australia. The ferry is situated some 50 kilometres north of Port Douglas, and gives access to the northern section of the Daintree National Park and to Cape Tribulation and north. The ferry provides the only sealed road access to this area. The ferry carries a maximum of 27 vehicles, and takes about five minutes to cross. The ferry is operated by a commercial contractor on behalf of the Douglas Shire Council. A fee is charged for the crossing. During the peak tourist season there are often delays crossing the ferry. Particularly between 10am and noon travelling north and between 3pm to 5pm travelling south. If you want to avoid the queues, plan to travel before 10am and spend the whole day exploring the rainforest and beaches, have dinner at one of the many restaurants and travel back in the evening. The ferry operates right up until midnight.